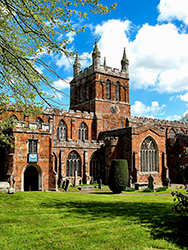 General Sir Redvers Buller VC, whose massive memorial occupies the whole of the east wall of the nave of Holy Cross, is by far the best-known person to have been born in Crediton in modern times. This image is reproduced with the kind permission of Devon Library and Information Services from the collection held in the Westcountry Studies Library, Exeter. Until the past twenty years when several writers have made more objective analyses of a mass of still-available documentation, he has had an undeservedly poor press. Buller was made, and remained for many years (he has an entry in a in a book published as late as 1994 entitled “On the Psychology of Military Incompetence” where the author directly compares Buller’s techniques of soldiering with those of Himmler), almost the sole scapegoat for the British army’s poor showing in the Boer War by fellow senior army officers, Conservative politicians, the right-wing press and by the authors of many books. The evaluation of him as an incompetent, indecisive soldier was based exclusively on assessments of his performance in South Africa in 1899 and 1900 by just two or three people –and the rest of a very distinguished forty-three year army career was completely forgotten. The Buller family and their immediate ancestors, were lords of the manor of Crediton from the late C17th. Their manor house, Downes, just outside Crediton on the Exeter road was built by Moses Gould in the late sixteen hundreds (although it was almost completely rebuilt over the next 150 years). The husband of Gould’s great niece, James Buller, inherited the estate in the mid seventeen-hundreds, the first of three generations of Whig and later Liberal M.P.’s who served Exeter and North Devon. Redvers Buller’s father, James Wentworth Buller who inherited Downes in 1829 sat for both Exeter and North Devon. The Buller family owned over 5,000 acres of land at Downes and in Cornwall which in the mid eighteen hundreds generated an income of over £14,000 a year –serious wealth. Redvers was born at Downes in 1839. After schooling at Eton his family bought him a commission (1858) and he entered the army, serving in India and China before joining the King’s Royal Rifle Corps –whose regimental badge appears to the left and right of the lower section of the Buller memorial –in Quebec (1870) as a captain –again a bought commission –subsequently taking part in the Red River Expedition in Manitoba –where he helped in putting-down a rebellion by the half-caste Metis people –the efficiency with which he did this attracted the notice of the expedition’s leader, Colonel Wolseley who described him as‘full of resource and personality and personally absolutely fearless, those serving under him always trusted him fully’. Redvers, a town in Saskatchewan, Canada, is named after him. Tough and brusque he was, but his troopers discovered that he was both accessible and sympathetic. If we were lying in the rain, so was Buller. If we were hungry, so was he. All of the hardships he shared equally with his men. Never did Buller, as commander, have a patrol tent to sleep under whilst his men were in the open. He was the idol of us all. It would be impossible to exaggerate what he accomplished with ‘Buller’s Horse’, a curious conglomeration of humanity –of varied nationalities, of every class of society, not excluding the criminal! But by his marvellous personality that unstable volatile body consolidated itself into an effective and dependable force which… (lost all) efficiency if the leader was removed…..I shall never forget how we all looked up to and admired him. Much gallantry was shown in rescuing the wounded and Buller himself was everywhere, spurring his men on, saving others who were cut off and not leaving the plateau until all were clear. On reaching the plain so many horses had been lost that only by men riding pillion on the remaining animals was it possible to get clear and ride for Kampala…….Buller had no sooner ridden into camp –after dark –than he was told that that he few remnants of Barton’s force were lost about 8 miles away. Despite the exertions and strains of the last thirty-six hours he imediately rode out to look for them. For his conspicuous gallantry and leadership at Holbane, Buller later received the Victoria Cross. He should have taken out a libel action against his face. He was repatriated, largely because of his ill-health, in August, 1879 –and his achievements in the Kaffir and Zulu wars were immediately recognised by his appointment as aide-de-camp to Queen Victoria, promotion to full colonel and by being made CMG, a Companion of the Order of St Michael and St George. I could talk to her for ever , and as if I had known her all my life. Col Buller is reserved and shy, with rather a dry, gruff manner. He also, though naturally averse to talking, told me much that was very interesting. He is very downright when he does speak and gives a very direct answer…..Col Buller is very modest about himself, saying he had got far too much praise. The Queen wishes me to see you, but it is not merely in obedience to Her Majesty’s command, but for mine own honour and gratification, that I venture to say I should be happy to see you here on the 25th inst. I do not share your distrust of Sir R Buller, who is most honest and straightforward I believe him to be a thorough gentleman, with considerable independence of Character and he had held aloof from the press, which perhaps others have not. Although he could communicate readily with his sovereign, from very early in his career he showed an almost complete inability to do so with the press –answering any questions from them rudely, if at all. Probably caused by his inherent shyness, this was certainly an important reason for their subsequent antipathy towards him. In April 1880 he was sent to Scotland as Assistant Adjutant and Quarter-Master-General, moving to Aldershot after a couple of months. Early in 1881 he was sent back to South Africa –where the first Boer War was under way. During an armistice in this war (there was no serious fighting after Buller’s arrival), he met Kruger and other senior Boers. They developed mutual respect and Buller’s sympathy for the Boer case was reinforced. He left Africa in December, 1881 –and during his long repatriation leave gave Downes some of the attention it had been lacking over the years. In August 1882, at the age of 42, Buller married Lady Audrey Howard a widow 5 years younger than him in St Margaret’s, Westminster. She had had four children by her first husband, who were treated by Buller as his own for the rest of his life. Redvers and Audrey Buller were just a week into their honeymoon when he received a letter from the now Lieutenant-General Wolseley telling him that a British invasion of Egypt was imminent and that he wanted him to be part of it. On arrival in Alexandria he was put in charge of intelligence and succeeded in putting together briefing material which ensured the overwhelming British success at the Battle of Tel el Kabir. The war (it is described as ‘The Egyptian Intervention’ in regimental records) was over within ten days of this rout –and Buller returned to Britain in early October, 1882 after just six weeks absence. Buller received a series of rewards for this brief spell in Egypt. A knighthood (he became KCMG –a Knight Commander of the Order of St Michael and St George –the badge of the order is featured to the left of top layer of the Buller memorial), a long leave –until July, 1883 –which was spent at Downes and an staff appointment as Assistant Adjutant General at the War Office. During the leave his only child, Georgiana, was born. In February 1884 he was sent to the Sudan where the Mahdi had risen against the Egyptian (Egypt was a British protectorate) occupiers. Buller fought brilliantly in both offensive and defensive actions as chief-of-staff to the commander, Major-General Gerald Graham and on his return to Britain (in April) was promoted Major-General at the very early age of 44. He returned to the Sudan in August of the same year as part of the force which attempted –unsuccessfully –to rescue Gordon from Khartoum. In the next part of the campaign Buller showed enormous skill in the organisation of a retreat from Gubat to Gaktal and won a battle at Abu Klea, but the British were eventually forced to withdraw altogether from the Sudan in 1885 and the war was considered lost, Buller subsequently returning to the War Office (being appointed a KCB Knight Commander of the Bath –shown on the right of the top layer of the memorial –for his service in the campaign). During the two stages of the Sudan war, and in every earlier overseas campaign in which he was involved, there is abundant evidence in writing (diaries and letters etc) of Buller’s liberal instincts and his great sympathy for native and oppressed people and every other sort of underdog. Confirmation of Buller’s considerable organisational abilities (and possibly his intelligence gathering qualities) was given by his being considered by the Liberal Home Secretary early in 1886 as “the best available candidate for Commissioner of the Metropolitan Police,” but later that year he was sent by the Marquess of Salisbury’s new Conservative government (he was reluctant to go –but considered it a duty to do so) to Ireland –where his natural sympathies were with the Irish tenants and peasants rather than their English landlords. He was appointed as a Special Commissioner to investigate ‘moonlighting’ by Irish police personnel, quickly winning the confidence of many Irish Nationalists and setting in hand policies which had some success in reducing the problem. As a result of this he was appointed, very unusually for a soldier, Permanent Under Secretary for Ireland (which was normally a civilian post). His views probably differed a great deal from those of the Government which he was serving and it is possible that his independence of view was remembered to his disadvantage in later days. He was appointed War Office Quarter-Master-General in October, 1887 within five weeks he had put forward a plan for major army re-organisation. 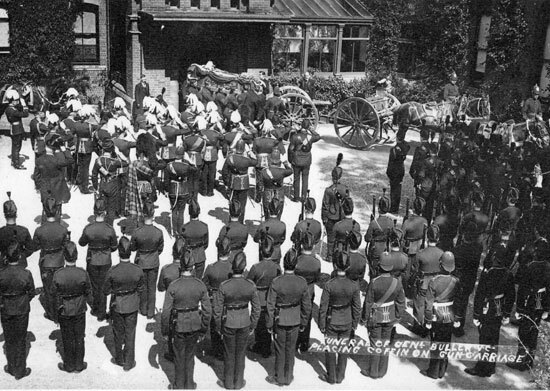 His suggested reforms reforms united army supply and transport in peace and war and just over a year later the Army Service Corps –initially housed in Buller Barracks (in early days recruits were known as ‘Buller’s Babes’) – still there –in Aldershot came into being. This survived –as the RASC –until 1965 and eventually became the Royal Logistics Corps in 1993). Importantly, both provisioning and transport were put completely under army control –each had previously been civilian-run Buller’s reputation as a fighting soldier was instrumental in the smooth creation of the corps which was achieved without any increase in costs. It can be fairly said that without the flexibility and control provided by the system evolved by Buller, the British Army would have been completely unable to mount the British Expeditionary Force in 1914. From 1890 to 1897 he was Adjutant General (becoming a lieutenant-general in 1895). 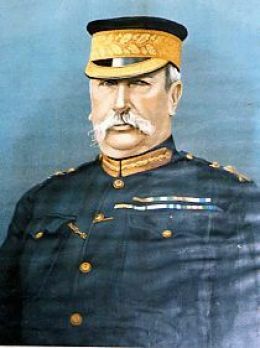 In his first years in the post his energy and ability inspired the belief that he was fitted for the highest command and in 1895 he was offered the post of Commander-in-Chief of the British Army by the Liberal government as successor to the Duke of Cambridge (in the early 1890’s he had been considered the next most powerful man in the army to him) –but it didn’t come to pass as a Conservative government was elected in August, 1895 and Wolseley was given the job. I have served under five Adjutant Generals at the War Office……but there was only one real Adjutant General amongst them, and he was Sir Redvers Buller. The rest did what was expected of them, but General Buller’s idea of duty was different from theirs, and he would not ‘let things slide’ and ‘hush things up’ and he stirred up the whole place. He thereby incurred great unpopularity with a certain clique in the Army, and you will find trouble comes from them. He struck me as a born leader of men, to be obeyed and followed without hesitation, and as being furthermore endowed with a penetrating and shrewd judgement……In the transaction of business he was admirable clear-sighted, firm and reasonable he knew exactly what he wanted, though he was prepared to take less if the House of Commons was not disposed to legislate to the full extent of his views. 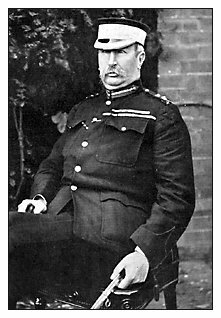 In 1896 he was made a full general and in 1898 he was given command of the troops at Aldershot. After a long period brewing, the Boer War broke out on October 11th, 1899 and Buller was selected to command the South African Field Force (the name given to the expeditionary force). It was a job that he didn’t want. He considered that he at 60 he was too old for it and that ten years in the War Office had had a stultifying effect on his ability to command in the field. He also thought that he was a far better second-in-command than a commander in anything complex. He put these opinions in his usual forthright way to Lord Lansdowne, the Secretary-of-State for War, but his objections were overridden (he and Lansdowne had a strong mutual antipathy, the latter was one of the absentee Irish landlords he so much despised). Buller was forced to move to the eastern part of South Africa almost immediately he got there the commander in Natal, Lt General Sir George White, had gone against Buller’s advice and moved his troops much too far to the north and as a consequence was trapped as Boer troops had surrounded the strategically important town of Ladysmith in northern Natal (the diamond mining town of Kimberley, further south, was similarly under threat) and a full siege started on 2nd November, 1899. 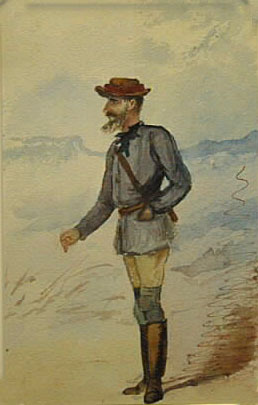 In his first attempt to relieve the town Buller was badly defeated by a smaller Boer force in trying to ford the River Tugela in the Battle of Colenso. 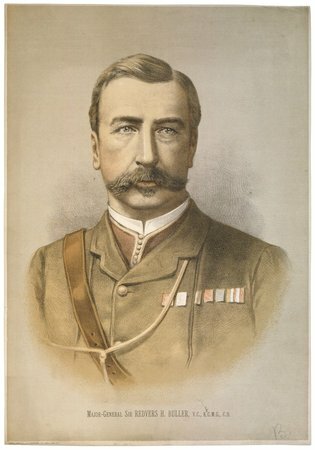 There were many reasons for the defeat: Buller let his senior officers’ have their heads’ far too much during the battle –he didn’t direct things strongly enough, relying on elderly, ineffective soldiers to make the right decisions an almost complete lack of topographical information made fighting in mountainous terrain very difficult and the superior arms of the Boers certainly told. 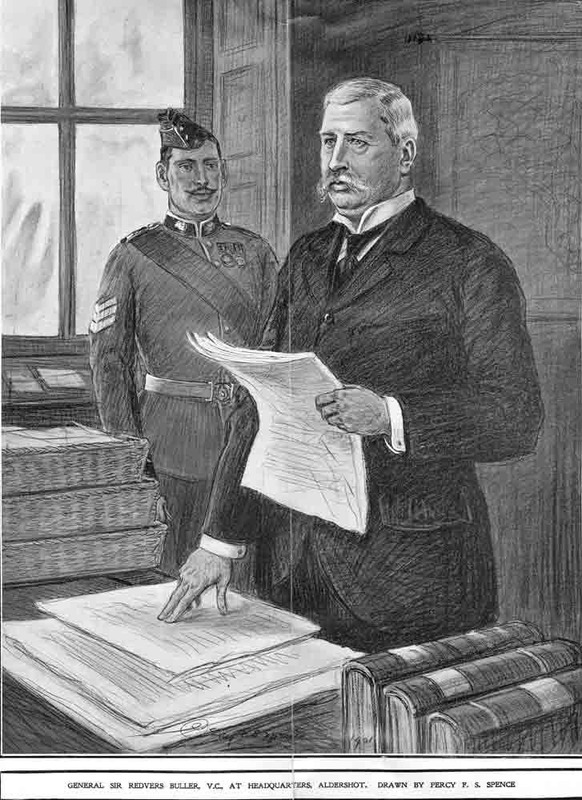 The government back in England was alarmed by Colenso and other military setbacks and the rather pessimistic tone of dispatches from Buller –the hands through which these passed upwards weren’t friendly ones as far as he was concerned, he had created enemies throughout higher command, and a Conservative government was running the war from London –so Lord Roberts was sent out to supersede him as commander. Buller made another unsuccessful attempt to relieve Ladysmith in mid-January 1900 at the Battle of Spion Kop (the Kop at Liverpool football ground is named in its honour) which was lost for much the same reasons as the defeat at Colenso in the previous month. Further attempts to relieve the city were repulsed and it was only on 28th February, 1900 that the siege ended (after 118 days) and Buller marched in with his troops. 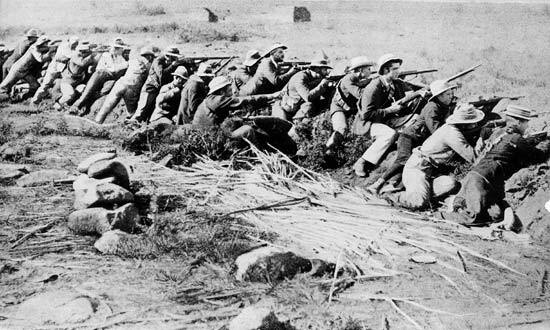 Buller’s ‘mistakes’ at Colenso and Spion Kop were, in fact, repeated by all the other British commanders in the early part of the Boer war –Roberts, Methuen and Gatacre –this was unknown territory for all British troops and their leaders, a mobile war against an enemy intimately familiar with the territory in which they were operating, and whose tactics were based on this knowledge. The Boers also had the advantage of greatly superior equipment. British soldiers were made to seem wooden and uninspired. Numbers of British troops were massively reinforced after Roberts’ arrival and it was this factor together with a gradual recognition that the tactics of the Crimean War didn’t suit either South African terrain or a terrorist-type enemy like the Boers and –towards the end of hostilities – the brutal treatment of civilians by Kitchener (including the introduction of the first concentration camps) which eventually won the war. After the relief of Ladysmith Buller fought successfully at Biggarsberg, Lang’s Nek and Lydenberg, but the loss of confidence in him caused by the defeats leading up to the relief made London recall him in October 1900 and reappoint him as head of the Aldershot Command (he was also made GCMG –Knight Grand Cross of the Order of St Michael and St George). On his return to Britain he was given a most enthusiastic welcome wherever he went, particularly at Aldershot and in Devon –but his ability to continue an important command like Aldershot was soon being vigorously questioned by those elements of the press in which he had created enemies (particularly by the Times war correspondent Leo Amery and the Spectator) and by ministers and right-wing backbench MPs amongst whom he had virtually no supporters in the background: Edward VII, King from January, 1901, was another opponent. The criticism centred on a message he had sent to one of his generals before Ladysmith which could have been interpreted as suggesting the possibility of surrender (the message was badly phrased, which he recognised). Through all this he was given the rousing support of his men wherever he went. On October 10th, 1901, he made an impromptu speech at a luncheon in London to try to answer the criticisms. He spoke in his usual straightforward way (recognising afterwards that parts of what he said were ill-judged) in trying to justify actions he had taken during the war. His speech was thought to be a breech of discipline and he was suspended on half-pay from the army a few days later (in effect, he had been sacked). 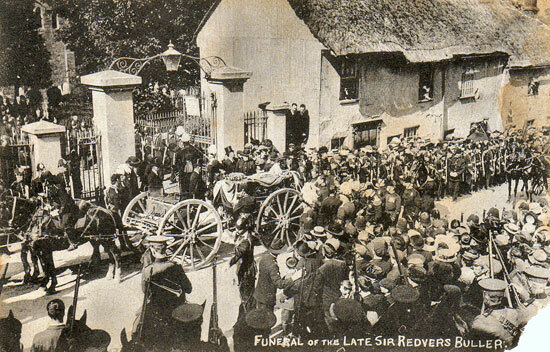 The rest of his life was spent at Downes accepting in dignified silence the prolonged attacks on his ‘failures’ in the Boer War but never loosing his great popularity among all elements of the public throughout the country but particularly in Devon. His splendid mounted effigy near the clock tower in Exeter was unveiled –very unusually –in his lifetime (in 1905) to much popular acclaim. His funeral in 1908 was a magnificent occasion and a couple of years later he was given an engraved stone memorial in the south nave aisle of Exeter Cathedral, a life-size bronze effigy in the north transept of Winchester Cathedral and of course the magnificent memorial occupying the entire east wall of the nave in Holy Cross, Crediton, all of these memorials being funded by public subscription. 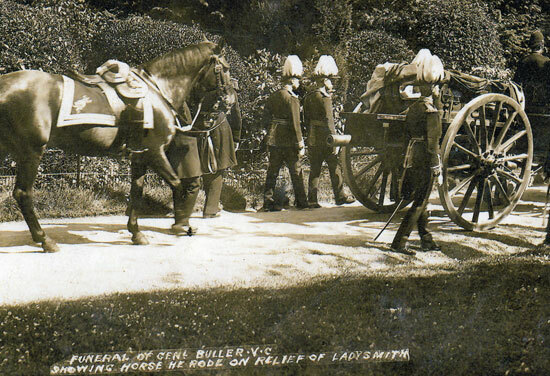 In foreign postings and in barracks in Aldershot and elsewhere in Great Britain Buller gave real support to the men serving under him and was a caring employer and landlord to the workers and tenants of his estates and farms in Devon and Cornwall. His caring attitude generated a tremendous loyalty towards him and affection for him was shown by the spontaneous applause from soldiers, his employees and many others when he visited an area. On his return home from the wars in which he fought –and particularly the Boer War –he was given a tremendous reception everywhere he went. When he died a mass of ordinary people showed their affection for him by lining the funeral route in great numbers, many subscribing to a fund for the building of the memorial still overlooking the nave in Holy Cross. He must also be remembered for what he achieved in the earlier years of his army career – in his War Office years by setting-up the army reforms that made the mounting of the British Expeditionary Force in 1914 a possibility his service in Ireland his remarkable bravery and leadership in the First Boer War, the Zulu War and the Kaffir War and his very significant contribution to many earlier campaigns. He was someone whose bravery, great powers of leadership and judgement, and qualities of humanity and straightforwardness shine out from so many of the current accounts of his life. A truly great man.